Today, if you have a mental illness, you have several options available to you. There are medicines for just about every ailment–in 2015 the global market for mental health drugs was valued at $88 billion–and when used in conjunction with psychotherapy, self-care, surgery, and alternative medicine, they provide millions of people with relief. But in the early and mid 20th century, your options were limited. 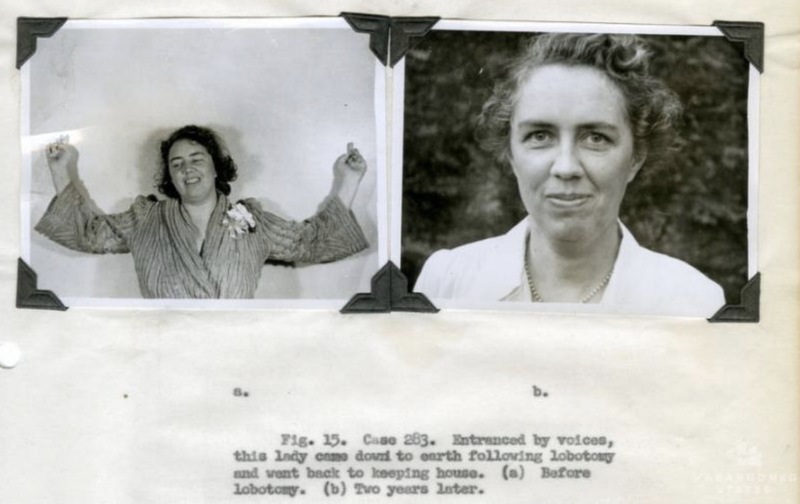 If you had any mental illness, there was a good chance you’d get a lobotomy–a surgical procedure where connections in the brain’s prefrontal cortex are severed. Humans have long believed that drilling holes into the skull and/or brain could relieve various physical and mental ailments–it used to be called trepanation, and the practice goes all the way back to 6500 BCE. 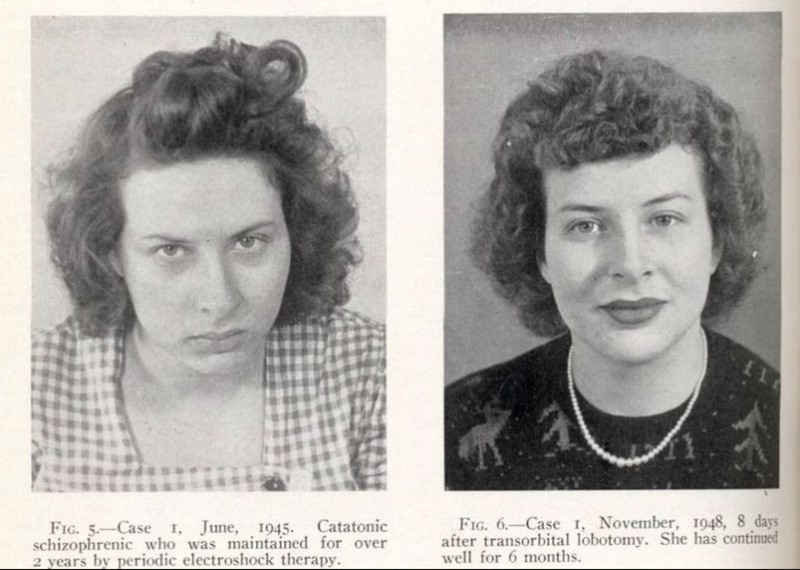 The lobotomy was comparatively sophisticated, but still nothing you’d want to endure unless you had to. In 1935, Portuguese physician Egas Moniz developed the first modern lobotomy, then called a “leucectomy,” to treat patients with obsessive behavior. Dr. Moniz would drill two holes in the skull, either at the top or on the sides. Then, he would insert a long sharp instrument called a “leucotome” into the brain itself and “swish it around,” destroying the connection between the frontal cortex and the rest of the brain. 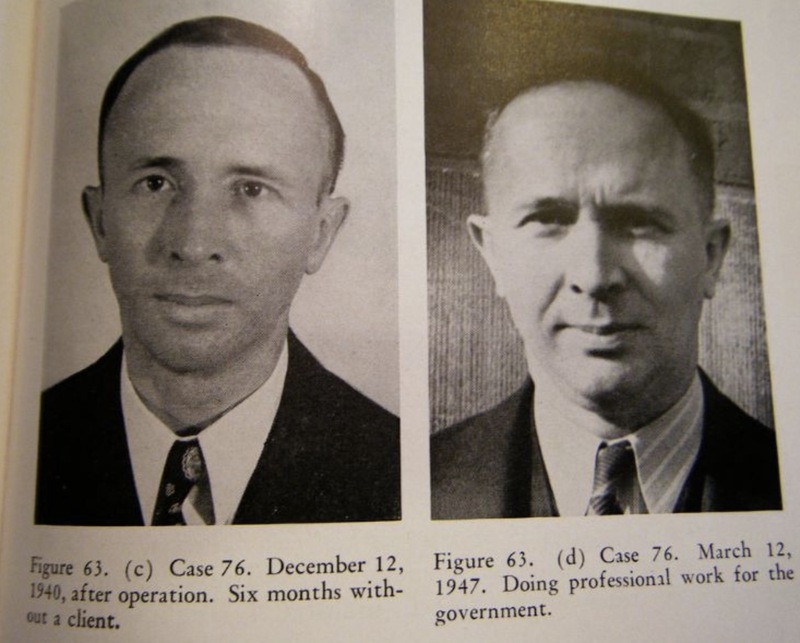 The following year, an American doctor named Walter Freeman, brought the procedure to the US. He later came up with a version that required no drilling. 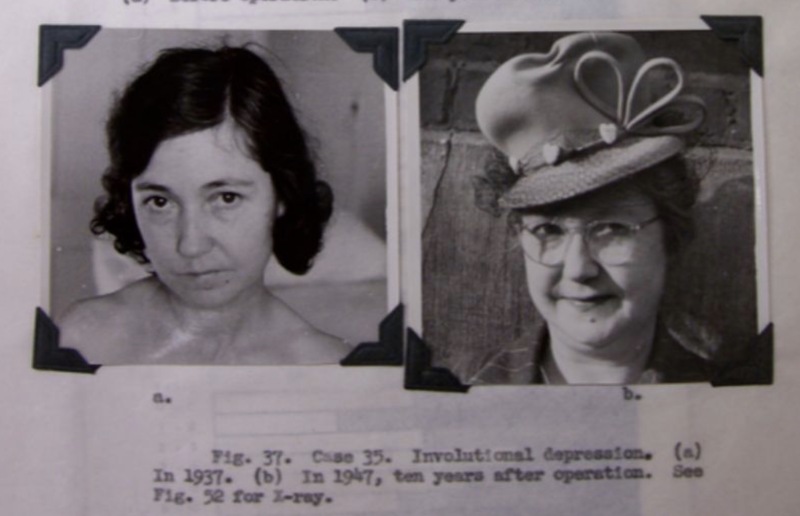 Dr. Freeman’s “transorbital lobotomy,” or “ice pick lobotomy,” involved inserting an ice pick into the brain via the eye socket and sweeping it across the frontal cortex. Dr. Freeman could perform several ice pick lobotomies in a day. Lobotomies sound barbaric, and they’re often depicted as such. When Jack Nicholson’s character gets one at the end of One Flew Over the Cuckoo’s Nest, it annihilates his entire personality and renders him non-verbal. 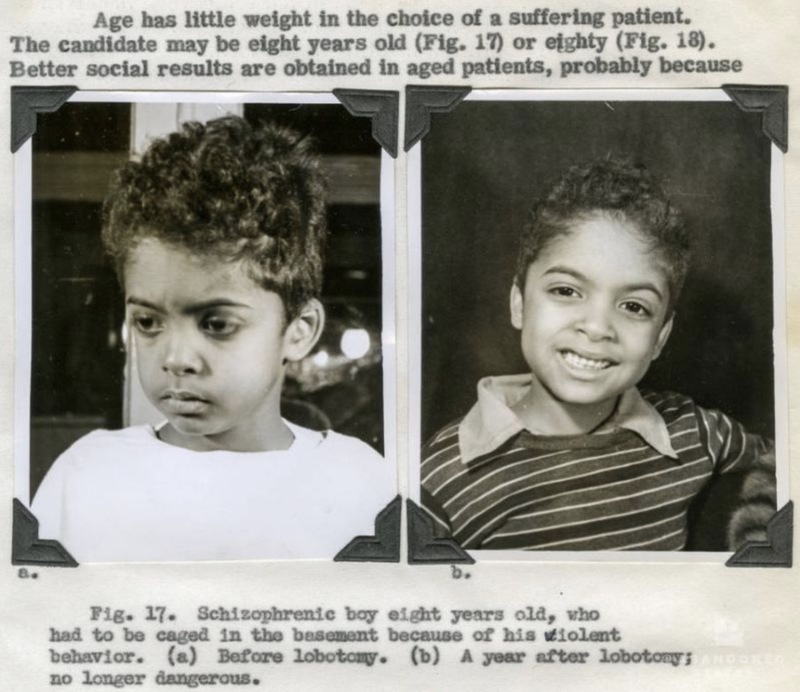 In reality, many patients did report positive results–aggressive patients did sometimes become more docile after having them, for example. 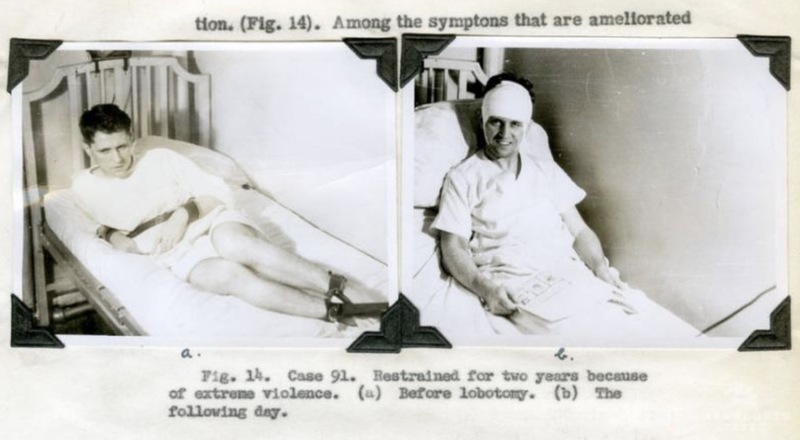 In the 1930’s and 40’s, lobotomies became a widely used remedy for everything from depression to schizophrenia. Take a look and be glad that science has left the lobotomy in the dust. 2. 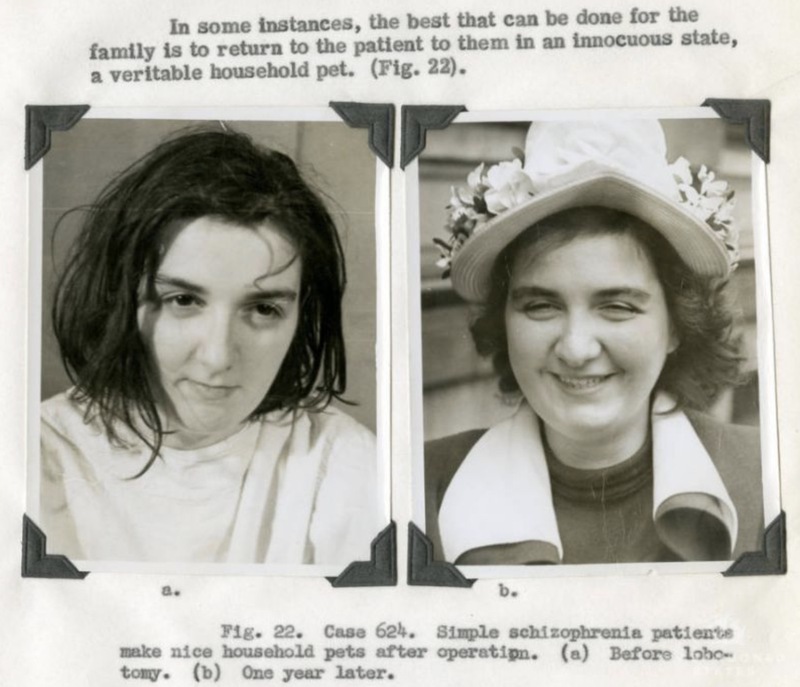 According to this journal, “Simple schizophrenia patients make nice household pets” after a lobotomy. 3. 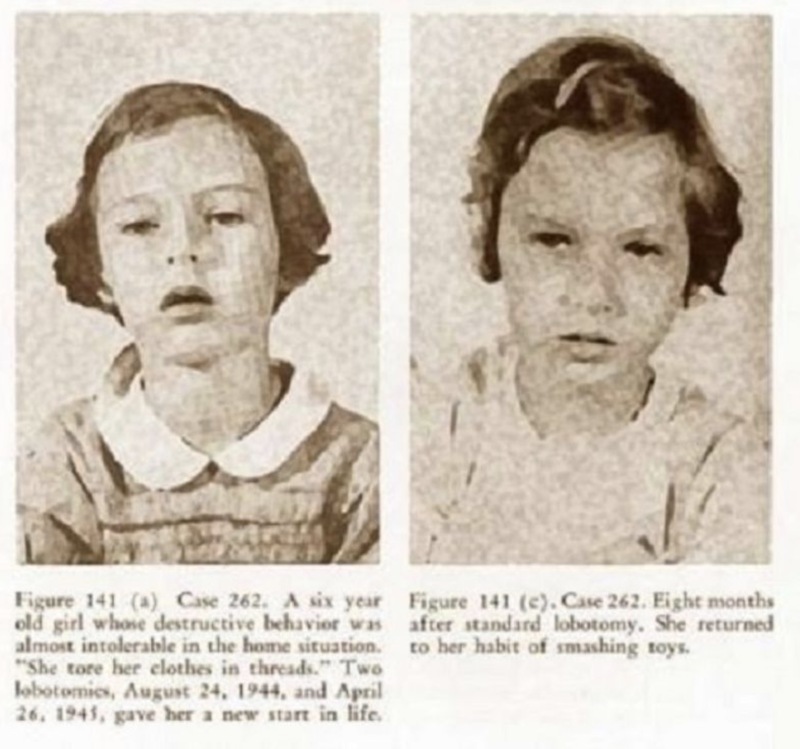 This six-year-old was known for destructive behavior, and was given two lobotomies in 1944 and 1945. Eight months later the destructiveness returned. 4. 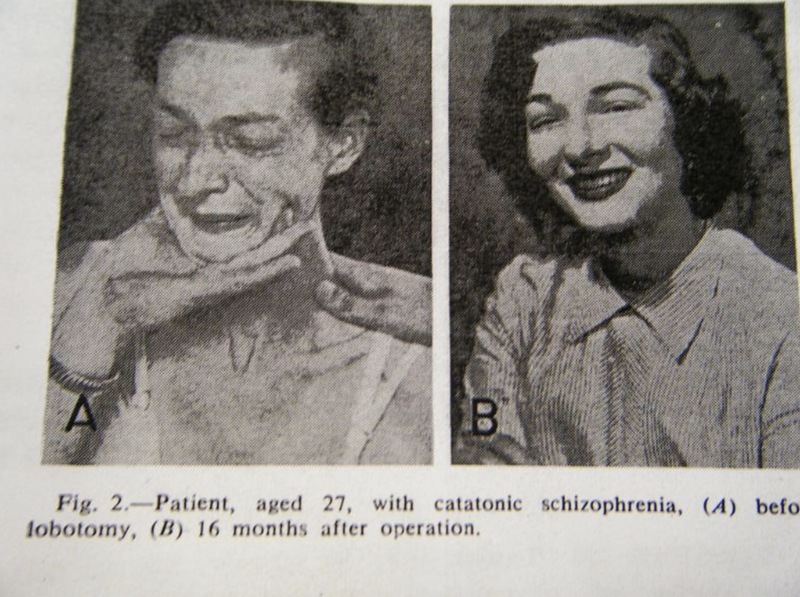 Catatonic schizophrenia patient, one year after treatment. 5. Seventeen months after the operation. 6. 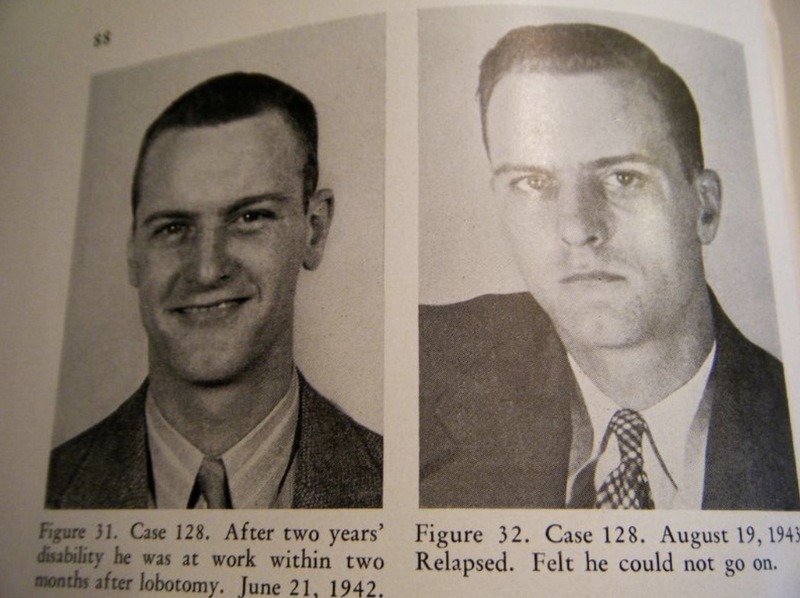 A 1942 lobotomy initially appeared to help this patient, but about a year later his struggles returned. 7. 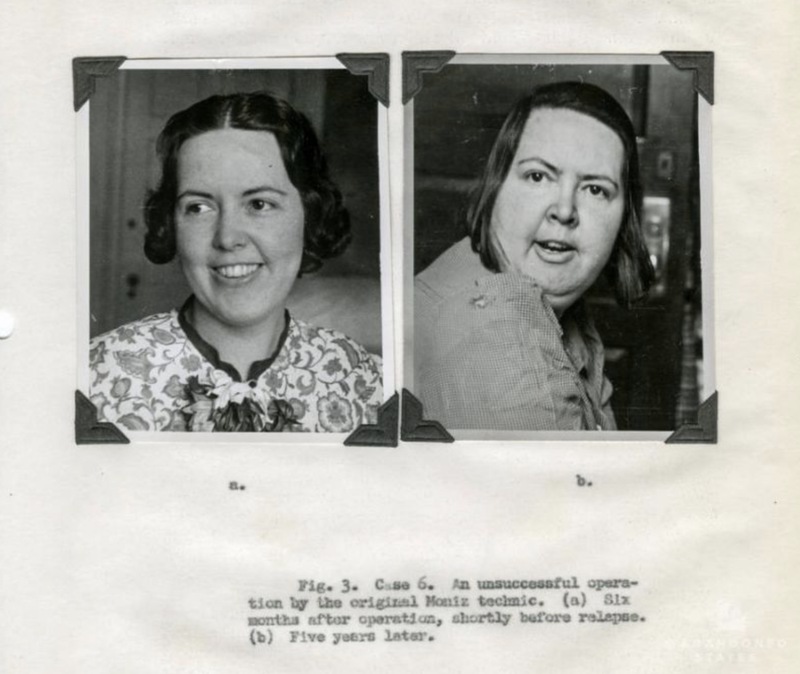 This patient appeared improved six months after her procedure. Five years later, her condition worsened. 8. 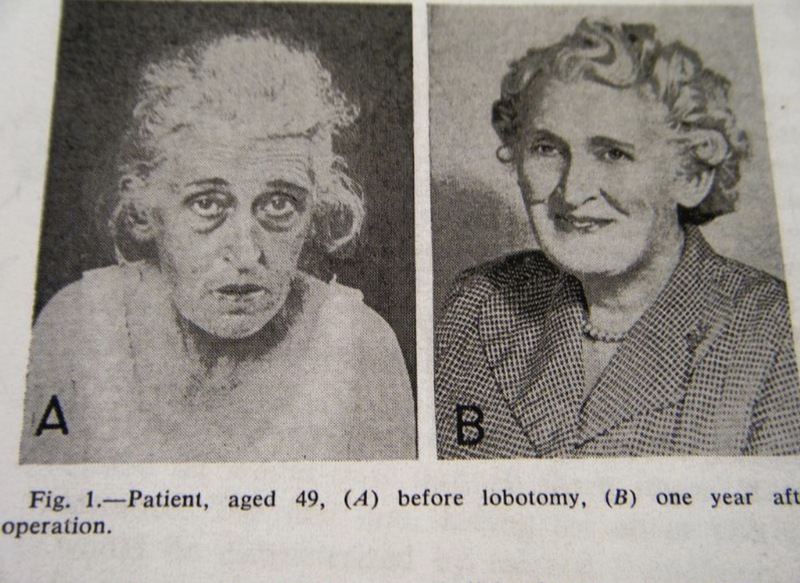 A 49-year-old patient, one year after her procedure. 9. Catatonic schizophrenia patient, 16 months after procedure. 10. 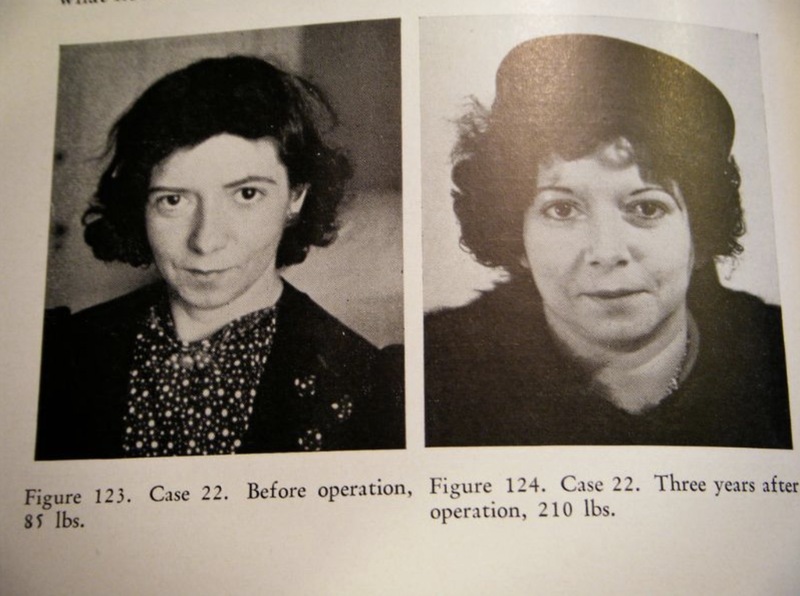 In the three years after her procedure, this patient gained 125 lbs. 11. 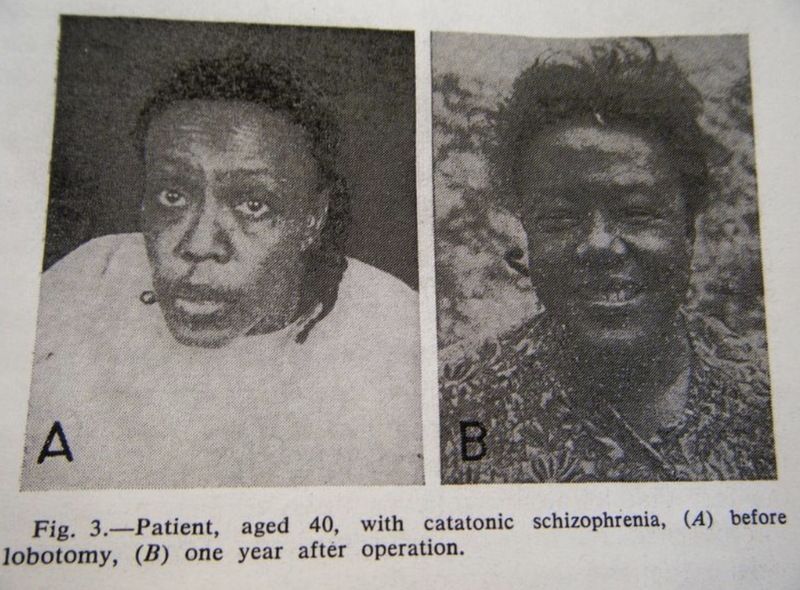 Schizophrenia patient, two years after her procedure. 13. 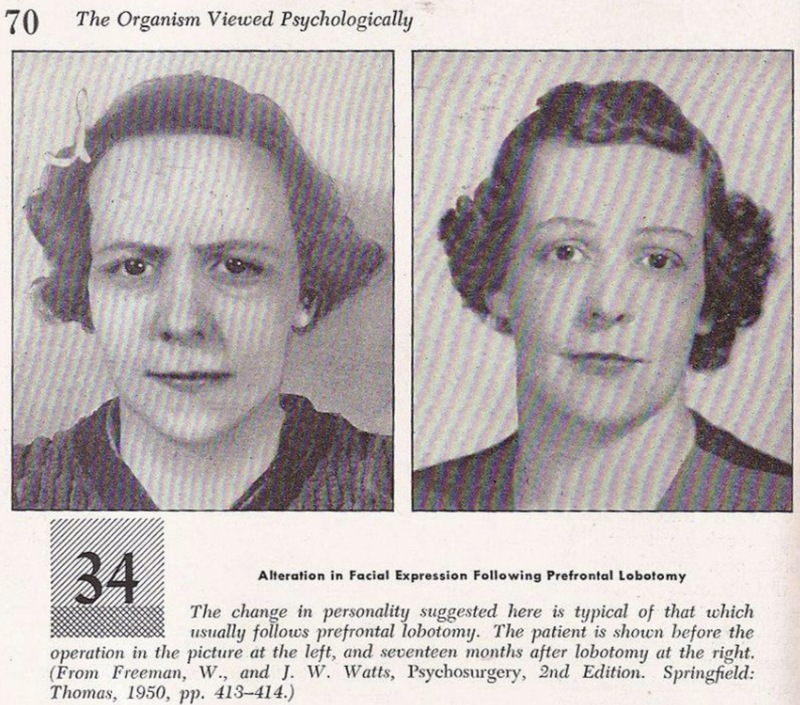 This patient was lobotomized in 1937 for “involutional depression,”–depression that affects middle-aged or elderly people. In 1947 she appears to have improved. 14. Seven years after his procedure, this patient was able to have a successful career. 15. 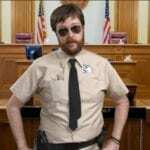 Patient lobotomized for violent behavior. One day later he was no longer restrained.